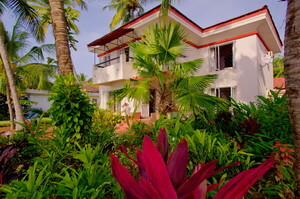 Our beach villas in Goa are right on the beach or just an easy walk away. Many of them even have a private beach so you will have complete privacy while you are relaxing on the sunbed. 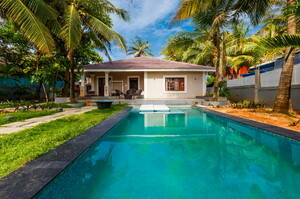 The villas have beautiful green compounds, security, all modern amenities, a private swimming pool, barbecue, and more. Choose from villas with 1, 2, 3 bedrooms and more, and stay on Goa’s beachfront in your own personal Goan home. The entire villa will be yours for the duration of your stay. 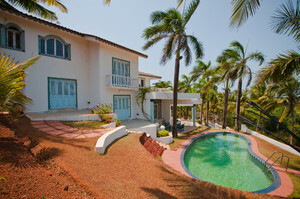 This is probably one of the most luxurious villas in Goa with a stunning ocean view from the mountain slope. 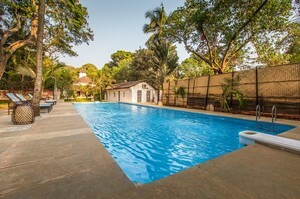 Live in a rustic and charming Goan heritage villa that is a 100 year old. Enjoy the best of nature and leisure at this luxury villa for rent in Colva. Beautiful premium villa, located on the picturesque banks of the river Sal. 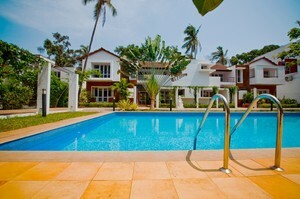 The beach villa in Goa Zuri White only 50 meters from the beach Calangute . 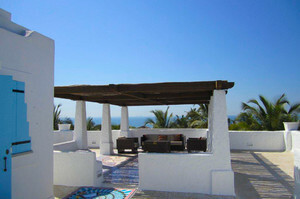 Fascinating European style villa Ostra Bella is intended for ultimate beach experience. Why stay at cramped and small hotel rooms, when you can spread out and enjoy the most comfortable vacation at beach villas in Goa? Many of the villas you will find here are designer masterpieces offering stunning sea views, swimming pools, tropical gardens, lounge space, and a fully trained professional staff including a private chef, butlers, and security. Expect top-notch services when you stay in these properties. You never know what you will get at the hotel, even a good one. New and inexperienced employees, noisy guests, food that is too greasy and not to your liking… it could be anything! And all this can ruin your vacation. 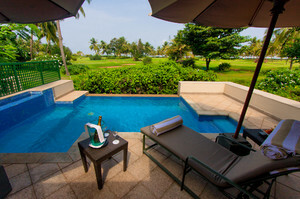 With luxury villas on rent in Goa, it will be your vacation, just the way you want. Large spacious rooms perfect for spreading out. Fully furnished, comes with all modern amenities. Free Wi-Fi. Waterfront properties or a few meters from the beach. Complete privacy. Gated community. Security. Your own private swimming pool. Don’t share it with anybody. Sundecks, loungers, tropical garden – all for you, and your group. Home-cooked food just like you like. Chef services. Perfect for larger groups staying together. 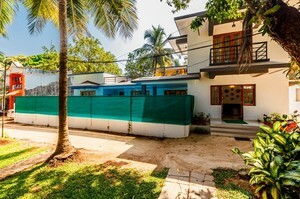 You can buy groceries and cook yourself at the modular kitchen or eat out at the many restaurants that are close to these private beach villas. Alternatively, you may ask for chef services too. The in-house chef can create local Goanese, Indian, and international cuisines, and also healthy food in your home-cooked style, which is often the best option if you are travelling with kids or old people. 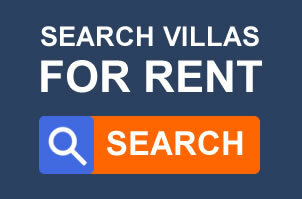 Goa villas are available for rent for the long-term or short-term in both North and South Goa. There are small 2-bedroom villas and large 5 or 6 bedroom villas that are a good fit for larger groups. There is the right villa for you, no matter what your group size. Need help selecting a villa? Let us help you. You can rent for just a few nights or for a month, or even more if you want. The longer you rent, the more you save. In fact, per-person, per-night, you will save more money than hotels and resorts that offer the same level of amenities and service. If you are a group of 6 people, and if the villa price is 15,000 per night, then it comes to just 2,500 per person, per night. Five-star facilities await your arrival at the best Goa beach villas. 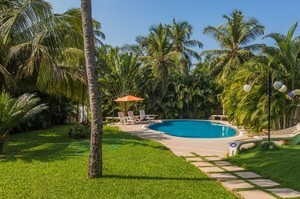 Villa Little Oasis – At Cavelossim in South Goa, just 50 meters from the beach! A good villa for 3-4 people. Private swimming pool, private landscaped garden! Best for romantic and family-friendly trip! You will get internet, satellite TV, power-backup, water purification system, fully equipped kitchen and gym. 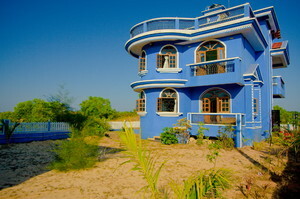 The villa is close to the golf course, Sal River and an Ayurveda clinic. Dream Valley Villa – At Candolim in North Goa! 900 meters from the sea! This villa with 3 private bedrooms is good for 3-6 people. Fully air conditioned, washing machine, a voltage inverter, a DVD player. Villa Zuri White – A private beach villa at Calangute in North Goa! Only 50 meters from the beach! This is a g villa with a large fenced area for 10 people. There are 4 full bedrooms. Gardening and maid service! Fully equipped kitchen, refrigerator, microwave, toaster. Beautiful private pool with greenery all around! Villa Lyon Age – A beach villa in South Goa, Colva, for 6 people! 1.5 kms from the beach. 3 bedrooms and 3 bathrooms! The villa comes with air conditioning, balcony, European furniture, microwave, refrigerator, 12x4 meter private swimming pool, loungers, and garden lighting. 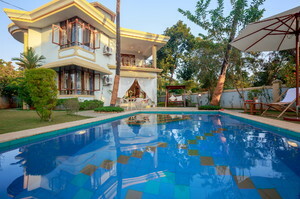 There are many other stunning seaside villas in Goa. Find them all here.